Discover the Camino to Rome joining our Via Francigena guided tours this September. Most of our Via Francigena trips are self-guided for independent travellers but we also organise guided tours departing on selected dates only. Our last Via Francigena guided tours of 2015 depart in September. Guided tours are ideal if you are looking to make friends and share your experience with a group. Walking to Rome from medieval Viterbo, you will follow in the footsteps of Sigeric the Serious into the Eternal City. Sigeric, Bishop of Canterbury, wrote about his journey by foot to Rome on the 10th century. Explore the old town in Viterbo, admire Sutri’s Roman amphitheatre, enjoy panoramic views of Rome from Monte Mario and complete your pilgrimage in St Peter’s Basilica in the Vatican. Starting in the pretty hilltop town of San Miniato, this Via Francigena guided tour takes the group on a wonderful walk in the heart of Tuscany, following its famous white tracks across the undulating landscape. 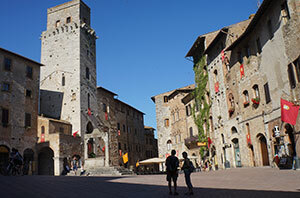 As part of this tour you will explore amazing UNESCO-heritage sites such as San Gimignano with its imposing medieval towers, inspiration for Shakespeare’s Romeo and Juliet; and magnificent Siena. Via Francigena guided tours include English-speaking guides, luggage transfers, half board accommodation and holiday pack. Viterbo to Rome guided tours also include airport transfer from Fiumicino airport (Rome). Price starts at €790 per person sharing. Dates for Via Francigena guided tours 2016 will be announced in the coming weeks, keep an eye on our Via Francigena Guided Tours page for updates. 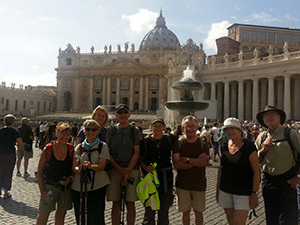 For more information about the Camino to Rome, our Camino guided tours or to book your trip, contact our travel specialists. I am interested in information on guided and non-guided tours Camino to Rome but I’m finding the information confusing – is there just 1 whole tour that covers the whole walk? rather than in sections?